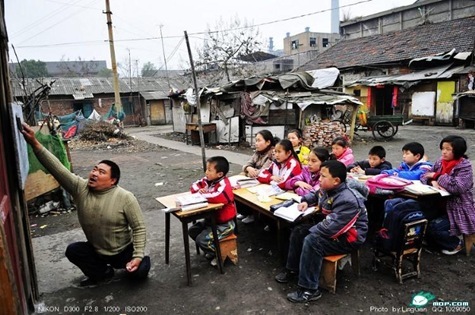 A legless teacher in rural China. Events that are occurring with a coworker of mine remind me of similar episodes that happened to me over the last couple of years. Like my coworker, I was given a letter two years ago, almost to the day, stating that I was accused of corporal punishment, and that I was entitled to representation for the hearing set for the day after spring break. Of course, that was not the most relaxing vacation for me, as I racked my brain trying to determine what on earth I had done that, obviously, had been misrepresented. My coworker likewise drove herself crazy trying to imagine what she could have possibly said or done to warrant such treatment. Neither of the allegations were detailed in the letters, which makes it hard to prepare a defense for the hearing, representation or not. Teachers are not afforded the same courtesy that, by law, allows criminals to be made aware of the charges against them. The worst part of these incriminations, for me, is not the student who creates a false scenario, nor is it the parent who believes such incredulous stories, nor is it the administrators who treat you worse than street thugs for outlandish charges. And, on a side note, the denounciations are always so unreasonable, that when I recount these stories to people, they literally do not believe them. A representative case is when I was called into a meeting, without any forewarning, with all the school's administrators and both parents of a child who cheated on a test. Even though I did not give him a zero, and allowed him to retake the test, I was accused of upsetting him by exposing his cheating. I still to this day cannot believe that one. No, the worst part in my opinion, is the other students who corroborate the stories. I know that in both cases, the students who confirmed the stories were likeable, good students. And I'll never know why they did it, because, of course, I cannot ask them. I know that middle schoolers like drama, and I am aware that they think teachers are mean and unfair. And, they are kids, and they don't understand the repercussions of what they are doing. But I still can't fathom why they would confirm lies that will potentially interfere with a person's career and livelihood. It makes me sick. And this brings me to the heroism. Going back into a classroom where students have betrayed you takes heroism. I means not letting the few bad apples nor the mindless followers get the best of you. It is hard, I can tell you from experience; so, so hard. The kids know they have the upper hand and that you are powerless, and yet you do it. You go back. That is truly heroic. I recognize this in my coworker. It will bring you down for a while, and it will taint your love of children and teaching. Hopefully you will be able to restore enough of your faith and you will like, if never again love, teaching once more, although cautiously and guardedly so. Keep fighting the good fight. Editor's Note: As of 3/28/12, she has not returned. I cannot blame her. Editor's Note Follow-up: I learned on 4/5/12 that she is not returning. I am sad for her, sad for the uninvolved students, and sad for all teachers.